Enterprises have many different types of users and those users access content across a variety of different devices. Because of this, all users need access to documents in different ways and sometimes this is not possible due to documents being created for certain computing platforms and software applications. 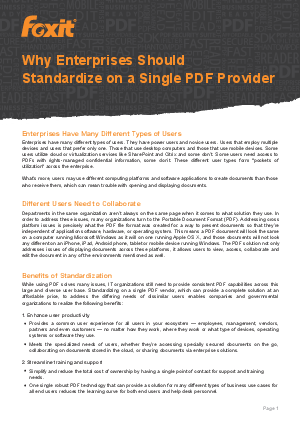 Download this whitepaper to learn why enterprises should standardize on a single PDF provider and see how this can allow for ease of use for all your customers.